The two biggest shopping days for online retailers are quickly approaching: Black your Friday and Cyber Monday. Ecommerce businesses across a wide range of verticals are using the Black Friday weekend as an opportunity to make more sales, increase brand engagement and broaden their audience. Preparation is essential if your business is going to make the most of this once-a-year opportunity. Get your ducks in order early and start letting your customers and potential customers know that Black Friday is coming. Over the last few years, consumers are increasingly aware of Black Friday. Many ecommerce stores will actually see a decline in sales in the run up to the event as customers anticipate better deals to come. Let your customers know what’s coming and create a buzz that encourages them to shop with you. If you have marketing plans to drive incremental traffic and customers to your website, you need to ensure your website is ready to deliver on your promises. A lot of websites see downtime on their websites so make sure your hosting can handle the increase in traffic. Black Friday is your opportunity to showcase your brand, and to encourage the weekend’s customers to return to you after the event too. A lot of retailers ask, ‘what can I do to boost sales for Black Friday’? We have listed different Black Friday marketing ideas to help you drive more traffic and sales during the biggest shopping season of the year. 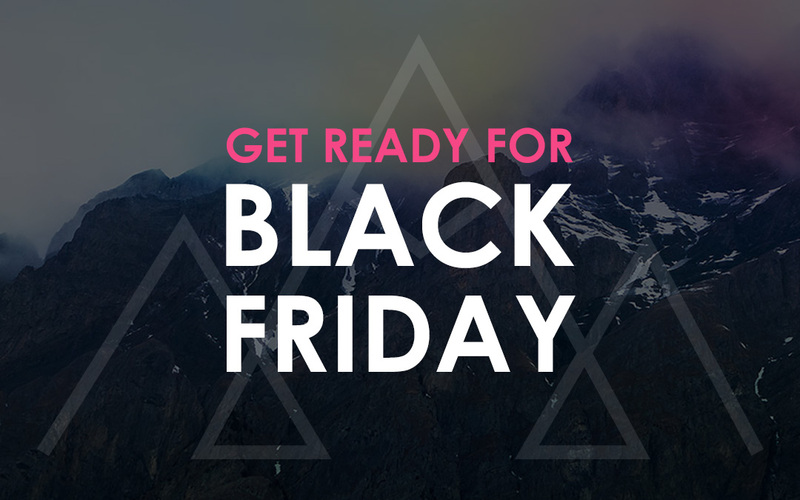 Get your customers excited in the run-up to Black Friday by creating social sneak peaks. Let them know what discounts they might be expecting, or encourage them to sign up to your newsletter to receive extra discounts. When marketing for Black Friday you should be taking advantage of Black Friday focused hashtags in addition to your regular hashtags. You’ll want to include hashtags such as #blackfriday #blackfriday2017 #cybermonday #sale #blackfridaysale #blackfridaydeals. This will allow you to reach customers who are specifically looking to score a deal. During Black Friday weekend, advertisers will be spending more than usual. The cost per click will also be higher than usual. If you plan to advertise on Facebook, Google or Bing, consider increasing your ad spend a few days out from Black Friday. This will give the ad enough time to optimize for conversions, and allow you to adjust and tweak along the way before the big day. Create new graphics and banners: You’ll want to create graphics for social media posts and email campaigns. You’ll need to create a new homepage banner graphic. Plan out social media posts: Automating your social media posts ahead of time will make your life easier. Write out the copy and relevant hashtags in advance. Plan out promotions: Run the numbers to figure out how much of a discount you can offer your customers without affecting your margins too greatly. If you have a remarketing campaign running, ensure your creative reflect your Black Friday offerings to increase CTR as well as intent to buy. If you don’t have remarketing campaign running, this is a great tool for brand awareness and something we’d highly recommend implementing. A lot of people will be doing their Christmas shopping on these days, so you can give them a helping hand by creating a gift guide. You could feature a mixture of products that are on promotion, and those that aren’t, or you could feature a special promotion just on the products that are featured within the gift guide. There are two ways you can easily create a gift guide: by creating a collection, or by writing a blog article. To get more traffic to your gift guides, feature them on your homepage or other places around your website where they’d get visibility. You can also email the gift guides to customers. If you chose to make your gift guide a blog post you can share it on social media and even boost the post on Facebook to drive more traffic to it. Alternatively, you can run a campaign similar to Lush last year. They launched the error 404 bath bomb, raising money for the Digital Fund with the #keepiton campaign . If you’re a service based business and are feeling a little left out of the Black Friday craziness, don’t worry, there are lots of ways you can get involved too. Why not offer a weekend free trial, offering customers to trial your service, making them more likely to convert as a paying customer? An effective marketing idea for Black Friday which has become much more common is extending your sale. Black Friday used to be the main day for retailers to have their best sales. However, with the growth of ecommerce, Cyber Monday emerged. As a result, most ecommerce retailers extend their sale to the full four days. By extending your sale, you’ll be able to draw in more customers and sales by having sales all weekend long. You can even start a little bit earlier than the other retailers. Throughout the day, release different offers and discounts. Engagement is key and you want your customers waiting to see what the next deal might be! These deals could be released on your social media or across email campaigns. A lot of brands will start featuring their offers from first thing in the morning, and by the time lunchtime comes around, everything has sold out! Find out how we can help your business make more of the Black Friday opportunity. We work with a wide range of ecommerce and lead generation businesses to help them drive traffic, engagement and sales. Get in touch today to find out how we can help you.